The Pope said that the Church was aware of the issue and “working on it”. In a rare admission, Pope Francis said that nuns have been sexually abused by the clergy of the Roman Catholic Church. On his way back from the United Arab Emirates (UAE) in the Papal plane, Francis reportedly told reporters that there have indeed been cases where nuns have given birth to children fathered by priests or have undergone abortions. “It is true. There are priests and bishops who have done that,” Francis said when reporters asked him to comment on a Vatican magazine article published last week detailing reports of sexual abuse by clerics. He, however, added that abuse happens largely in “certain congregations, predominantly new ones”. According to the BBC, the Pope said that the Church was aware of the issue and “working on it”. Referring to his predecessor, Pope Benedict XVI, Francis said that he had “the courage to dissolve a female congregation which was at a certain level, because this slavery of women had entered it – slavery, even to the point of sexual slavery – on the part of clerics or the founder”. In November 2018, the International Union of Superiors General – the Catholic Church’s global organisation for nuns – denounced the “culture of silence and secrecy” that prevented them from speaking out. Across the world, nuns have come out with allegations of sexual abuse at the hands of the priests. A similar case in India’s Kerala, in which a Bishop is an accused, has been making headlines since last year. Reports say that Francis is under pressure for neglecting the victims of child abuse but the nuns’ appeals have gained prominence thanks to the #MeToo movement. The Pope was returning to Rome from a historic trip to UAE becoming the first head of the Catholic Church to have visited the Arabian Peninsula. In Abu Dhabi, the Pope held an open air Mass and called on Christians to promote peace in the region. “It is my hope that you will be like this, rooted in Jesus and ready to do good to those around you. 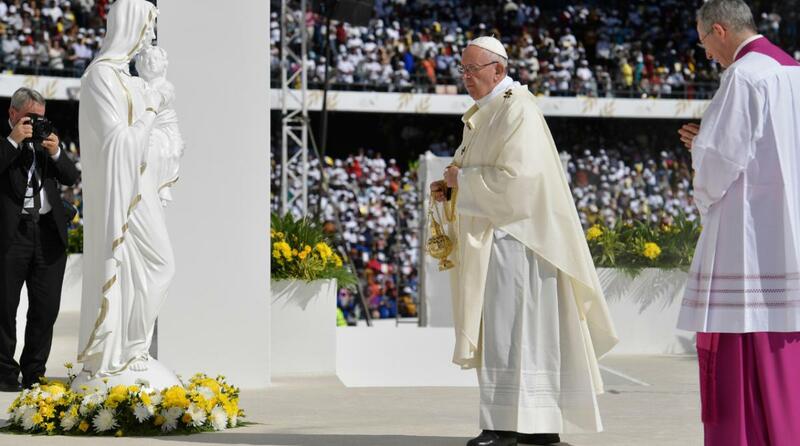 May your communities be oases of peace,” the Pontiff, who arrived in Abu Dhabi on Sunday on a three-day trip, told over 170,000 worshippers, mostly migrants, at the Zayed Sports City Stadium.